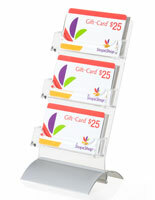 9 pockets hold up to 100 prepackaged gift cards! Revolving design is easy to use. Built-in sign holder lets you create your own signage. 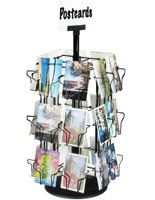 Try this space-saving display product for your point-of-purchase countertop. 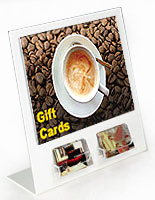 Made from black and clear acrylic, our revolving gift card holder incorporates 9 clear pockets that can hold 100 pre-packaged gift cards measuring at 4" wide x 3" tall. (Check these dimensions against your own gift card requirements since not all packaging is the same.) 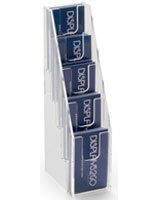 Card pockets with 3" tall cards in them will have 2" in between. 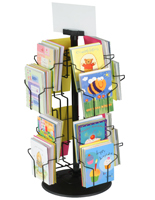 A gripper at the top allows you to display your own custom sign. It is recommended that this be printed on card-stock paper. 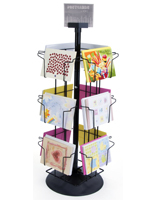 Place this revolving gift card holder at your impulse-buy location for all to see as they check out. The overall dimensions are 9" in diameter and 12-1/2" in height. 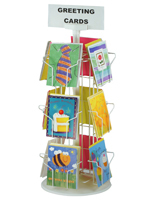 I ordered 4 for our associates to use when filling gift card orders. 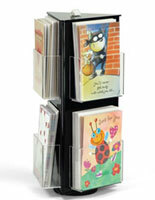 It keeps the various designs organized and visible for restocking purposes. Will order again in the future!